The TactLite Stock says it all in the name. Weighing only 5.86oz this skeletonized M4 style stock is dropping weight not features. Its TrackLock system Eliminates horizontal and vertical movement on the buffer tube provides smooth secure stock adjustments and eliminates the need for secondary locking mechanisms. 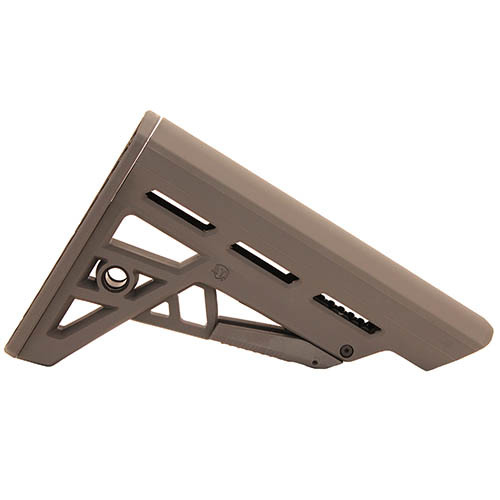 Unlike some adjustable stocks this one does not interfere with the charging handle when folded completely forward. Other key features include no snag point thin recoil pad dual sided QD attachment point tactical sling attachment.Note No Buffer Tube is included in this package. This stock will accept a Military Buffer Tube.